The ROK Espresso Coffee Maker is all about the design. In the way it functions and looks. Yet makes freshly brewed coffee without the need of electricity. Meaning you can use it anywhere. Let's start by discussing the design. It's what makes the ROK Espresso Maker so wholesome and unique. The first criticism I'd like to make and get out of the way, is that the bottom drip tray isn't removable. Which mildly hinders what was an easy cleaning process. To clean the machine I pour a cup of water through the ROK at the end of a day. Of course I have to also knock out the used coffee from the portafilter and then quickly rinse it, but all this takes around fifteen seconds to complete. Unfortunately every now and then I have to wipe down the base. Rarely does any liquid spill, but when it does, it drys and can be quite time consuming to remove. Overlooking this small inconvenience, the ROK is fully functional and an easy to operate coffee maker, designed by British designer Patrick Hunt. The entire unit is constructed from polished aluminium, it looks rather dashing in my kitchen. It's compact in size too, so if space is a concern this is a good entry. It takes up less space than my cafetierè. But because no electricity chord is needed, the maker can be placed anywhere in a kitchen. Offering the freedom a conventional coffee maker can't compete with. After using the ROK, I realised that a battery powered coffee maker would be very convenient but after some research I discovered this market doesn't yet exist. To operate the ROK, simply press finely ground coffee into the portafilter and attach it onto the water chamber, which I found to be rather satisfying. Then pour boiled water into the water chamber just above the metal rim, you can pour more if you'd prefer a weaker coffee. Now place a cup under the portafilter, lift the arms and pause for a few seconds to infuse, then slowly squeeze the arms down and repeat to produce a double shot of espresso. Of course this amount is only enough for one person, if a family wanted to use this as a household machine in the morning, it might just be a little too time consuming. Also taking into account that this doesn't heat up the water. The outputted coffee is consistent and never contains any ground coffee, so the filter is good at it's job. The quality of the coffee is totally dependant on the type of ground coffee used but after using the included pouch of ground coffee from ROK and my other favourite make. The espressos are thick with a good amount of cremà and are very defined. You can also make a Cappuccino, a Latte and a Macchiato. Detailed written instructions for each are included. Essentially for each you need frothed milk. ROK include a handheld frothing device, that also works brilliantly with hot chocolates. We did test the ROK against the Aerobie Airpresso and have concluded that the coffee produced from both is identical, but the price isn't. The ROK retails for £129 and the Aerobie AeroPress retails for £24.99 within the UK (a similar difference is present within the USA too). If price wasn't a factor, the ROK is the clear winner of the two, because of the design and fuller package. The big price difference doesn't really seem justified though. But I'm sure lovers of coffee and design will adore it. As I've already stated this is a very wholesome product. 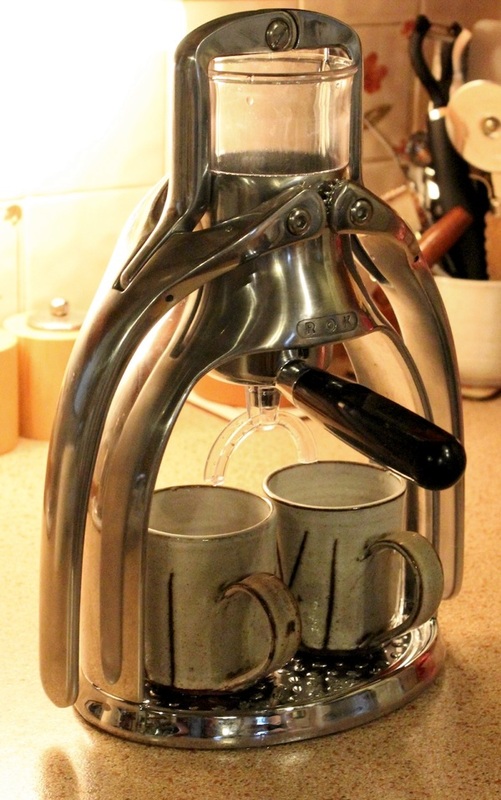 Something I also quite liked about the ROK Espresso Maker is that it doesn't come in a box. Instead it's found within a very high quality metal tin. Something that could be used as a very fashionable storage device. Also worth noting is the included ten year guarantee, yes ten years! Overall the Rok Espresso Maker is a good hands-on and environmentally friendly method of coffee making.